AMobile's worldwide first mobile inspection assistant G60 with powerful Push-to-Talk (PTT) function, featuring SMART, Secure, Manaing, Advanced, Ruggedized, Thermal, it is an industrial-grade powerful mobile device with not only rich wireless communication, but multi-data capture, connectivity, and management securely for industrial applications. They comprise fire cause determination, maritime, detect and rescue, metallurgy, building quality inspection, anti-terrorism, and medical, etc. to increase work efficiency and accuracy. 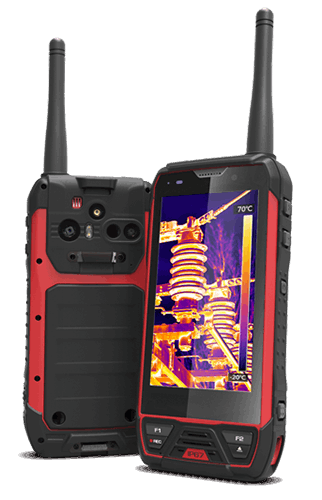 G60 is an innovative product with technology breakthrough designing for thermal imaging inspection from a distance of up to 10 meters, as well as PTT and WorldMode 4G LTE communication to meet the market demand for industrial all-in-one mobile devices. Using infrared radiation lens with imaging lens achieve thermal imaging to display object and ambient temperatures. In addition to enhancing inspection and maintenance accuracy and reliability, G60 prevents inspectors from being close to superheated and dangerous areas to improve safety. NFC Embedded for crew identifies verification to enhance security toward device control, the optional UHF reader up to 5 meters for collecting data from equipment to improve asset control, management and dispatch precisely. In addition, sensors in G60 such as Gyroscope, Light sensor, G-sensor, M-sensor, etc. can tie in with the App developed for multi-data collection for real-time monitoring and recording. For example, with G-sensor and M-sensor in G60 devices which detect if any accidentally falling or impacts from crew or devices and the notification will be sent to control center. Or crew can also push the On-button Alarm to secure their safety to achieve a real-time monitoring. Built-in Direct Mode Operation (DMO) module that supports Push-to-Talk (PTT) for point-to-point or group intercom. If the signal in private or public network is failed, the PTT function can be used alone to communicate with other G60 devices in the same area. G60 supports 4G LTE calling, data communications, and dual SIM sockets built-in. Field crew can manually switch the key for changing the mode of a public or private network at work. Also, during inspection work, patrol tracks can be recorded and uploaded to the control center for attendance check and dispatch reference, as well as real-time report field circumstances to the center for rapidly handling and optimum deploying. Besides, with one-button alarm bulit-in, when users press the alarm key, the center or police station will be first notified to deal with the emergencies.